ONI Bureau: After the exit of former BJD MP Baijayant Panda from the party, who enjoys substantial support in the constituency due to the good work he has done whether installing over-head water tanks or repatriation of Odia migrant workers in distress, BJD President and Chief Minister Naveen Patnaik has gone on a mission mode to woo people of Kendrapara. 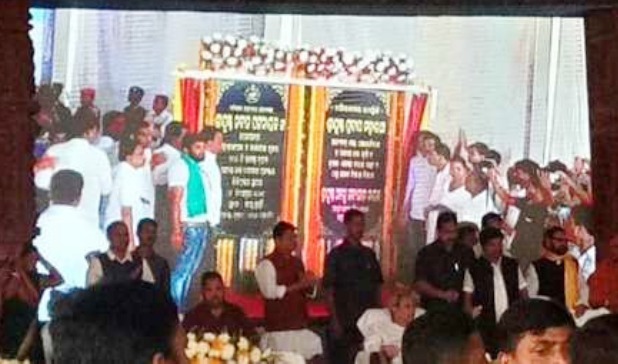 The Chief Minister laid foundation stone for the mega drinking water supply project under ‘Basudha’ scheme at Sarumuhi village under Mahakalpada block in Kendrapara on Saturday. The Rs 241 crore drinking water project will benefit 2 lakh people of 148 villages of Mahakalpada block and 52 villages of Marsaghai block. The CM also told the people that since Kendrapara were very close to late Biju Patnaik, he will leave no stones unturned to work for the development in the area. He also talked about the Riverine Port project on River Mahanadi in Kendrapara, which was announced in July 2018. “I am happy to be in Kendrapara. I hope you are also happy with this drinking water project”, he said.